When disasters strike, everyone needs to look out for each other. After an unusual amount of rainfall last week, Missouri, Illinois and a handful of neighboring states are facing extreme flooding that's left more than two dozen people dead and thousands displaced. But even in the middle of helping each other, some residents are keeping an eye out for the smaller victims. 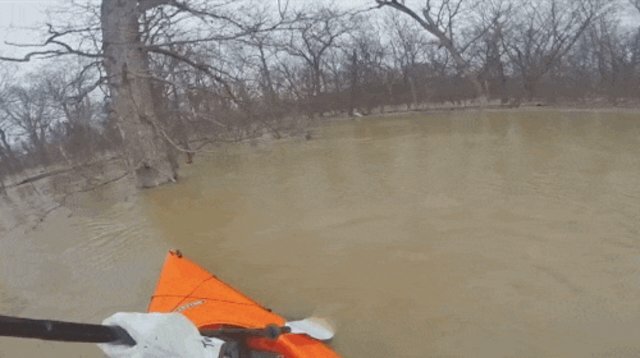 Tony Weiss was kayaking down the Meramec River in Missouri last week to survey the damage when he spotted a young squirrel clinging to the tree in front of him. As he watched, the squirrel tried to jump off the tree, but quickly began to be dragged downstream. Paddling up to him, Weiss reached out an oar to help the squirrel onto his boat, then gave him a brief lift back to the safety of his tree. "You got it, you got it, you got it!" Weiss calls out in the video. "I know squirrels don't understand English but I couldn't help but yell out some positive encouragement," he later wrote in the video description. 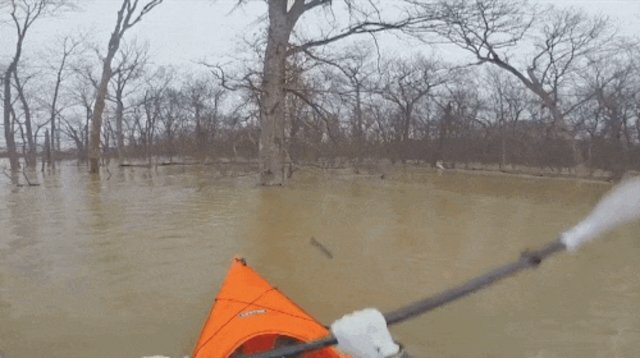 Like all of the flood's victims, this squirrel probably had a rough few days ahead of him. But with any luck, Weiss' helping hand was the difference between life and death. If you'd like to help the human victims of the recent flooding, you can make a donation to the American Red Cross, which has opened shelters across the affected areas.